It sounds almost too easy, but the delicious truth is….it really works! I tried several version of this recipe, each with just tiny changes because the first version I tried already turned out quite perfect. Except for one thing: The crumb needed just a little bit of help to get it from a slightly cake-like stage to something a bit more cohesive. 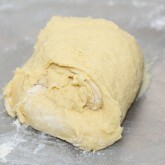 So, just before I pop the dough in the fridge for a well deserved 48 hours rest, I give it one or two stretch & folds. I also tried versions with slightly more (5ml) and slightly less water. 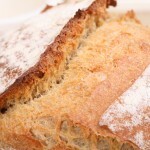 The version you find on this page is the recipe that works best for me. I am very pleased with the result. 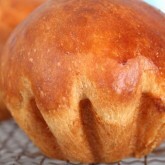 Also check out the short video we made of the making and baking of the brioche. 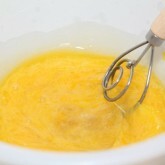 In a bowl, combine eggs, honey water, salt and melted butter and whisk, somewhat vigorously, for about 30 seconds. 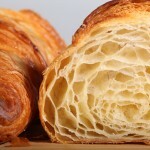 We do this with a Danish dough whisk. 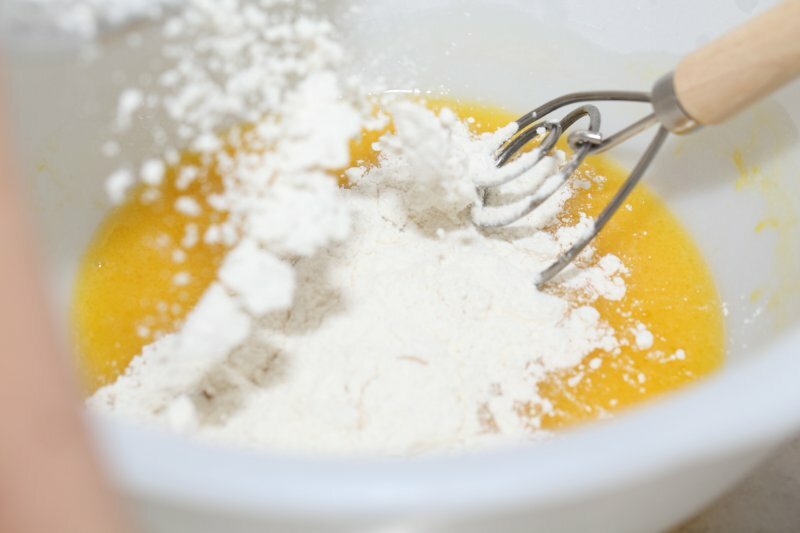 Add the instant yeast to the flour and sift it into the mixture. 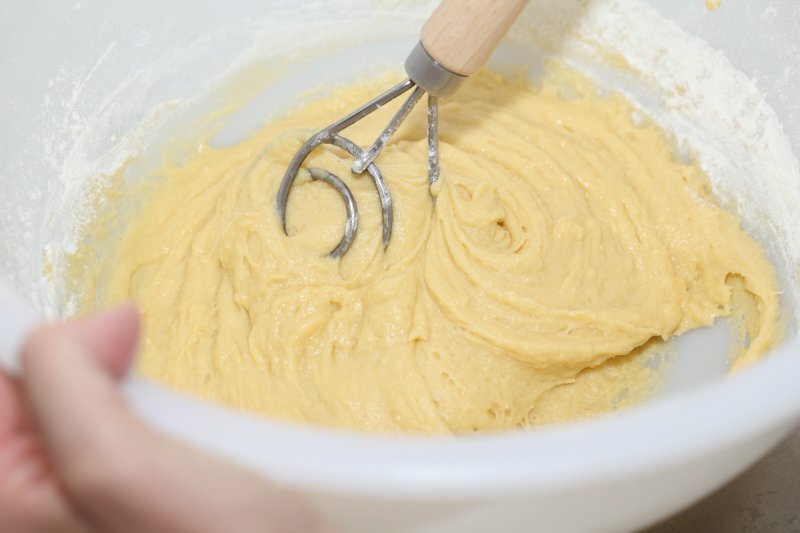 Again, with enthusiasm, whisk for 30 seconds until your dough looks smooth and homogeneous. 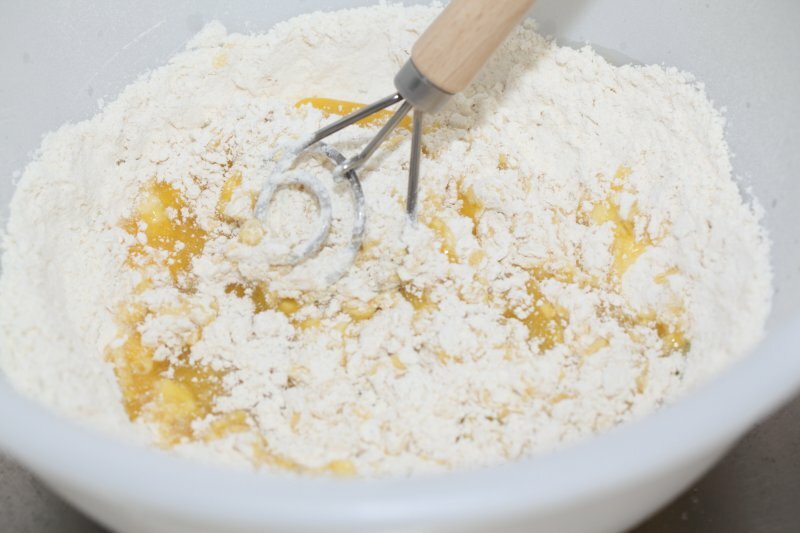 Cover your bowl and let the dough rest for two hours at room temperature. 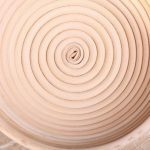 Take the dough out of the bowl and onto a floured work surface and do one or two stretch and folds (full fold ones, left over right, right over left, bottom over top, top over bottom; see our bread movies to observe this technique if you are not familiar with it). 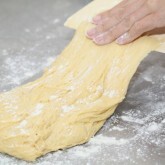 If your dough is very ‘elastic’ and cooperative, do a few, if it starts to resist you can just stop. 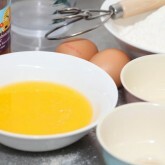 Return the dough to the bowl, cover it with clingfilm and take it to the fridge where it will stay for 24 to 48 hours. I have made several versions using both dough that had rested 24 hours and dough that was allowed to rest for 48 hours and I can say the results are both fine, not that big of a difference. So you can be a bit flexible when it comes to that. Some people leave it even longer. I have not tried that, but I cannot see it would get any better, maybe it would even dry out. I have read about people leaving it in the fridge up to 5 days. All I can say is that, with the fine results I got within the 24 to 48 hours range I saw no need to take it any further. 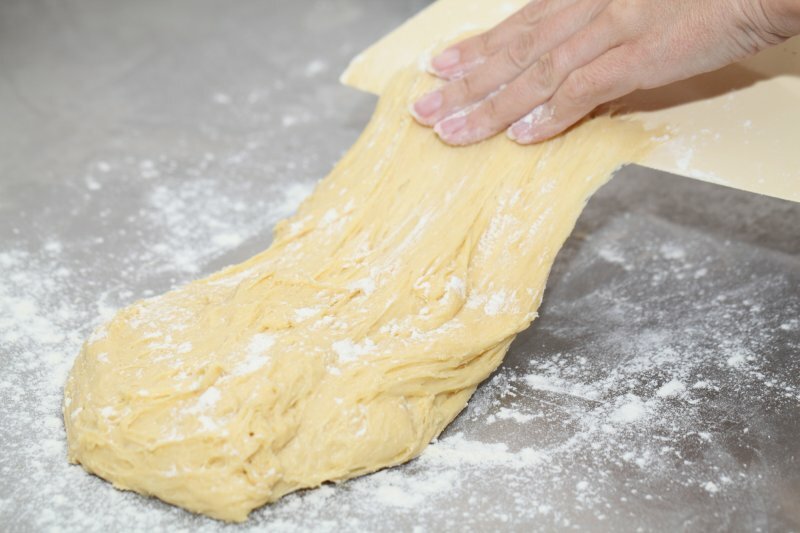 Take the dough out of the fridge. Now it is time to shape. You can choose any shape you want of course but this is how I do it most of the time. 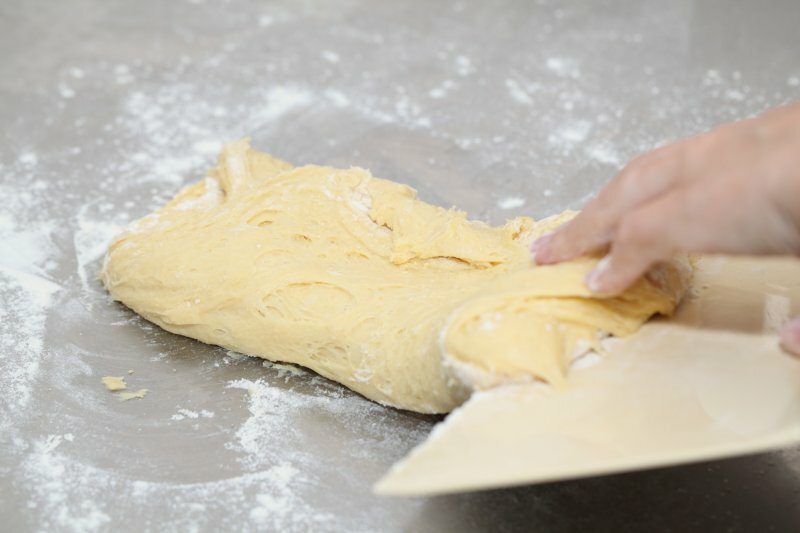 Divide the dough into 4 or 6 equal pieces and shape them into balls (shaping quickly while the dough is still very cold from the fridge goes best). 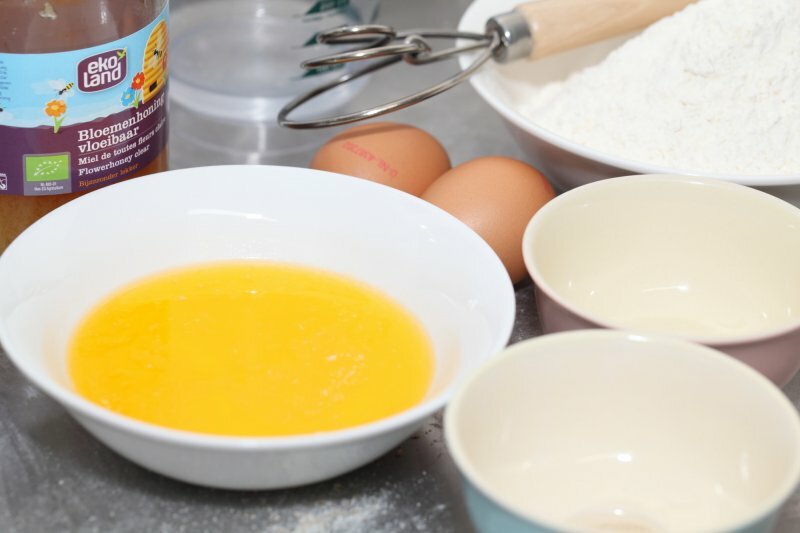 Place the balls two by two in a baking tin, well buttered or lined with baking paper. Cover and leave to proof for 2 to 3 hours, depending on the temperature of the dough and of the room. 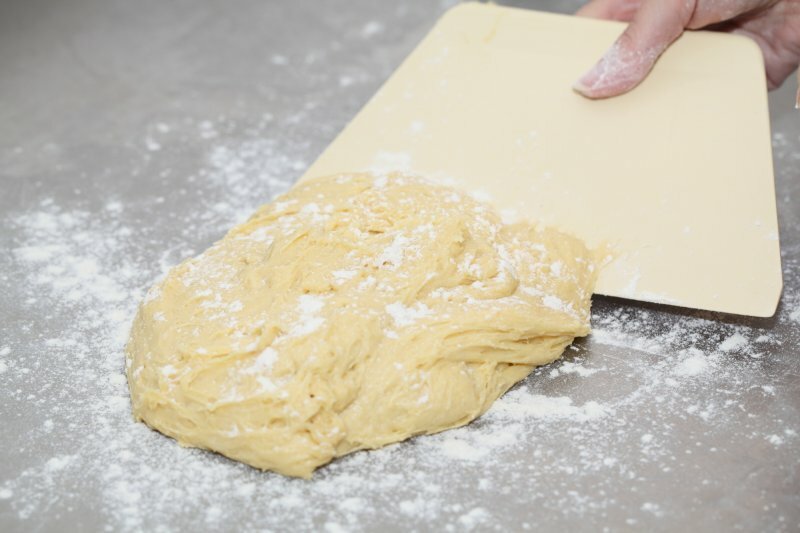 It is important to take the time needed, to proof the dough to perfection. 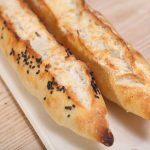 You might also want to check out our tips on dough temperature to help you improve your baking results. 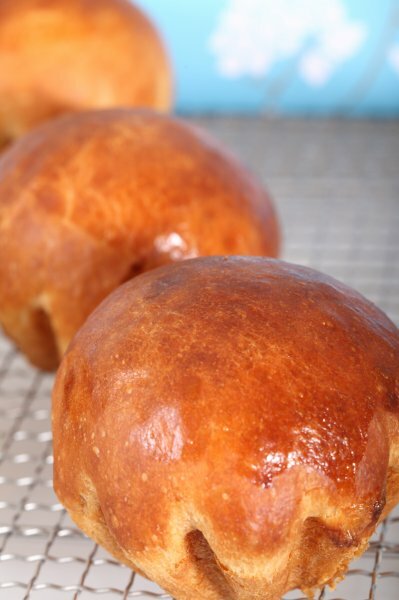 It is best to cover the brioche with something that does not stick to the dough or weighs it down. 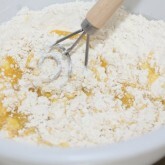 That is why I just turn my mixing bowl upside down and use that as a cover. It works really well. 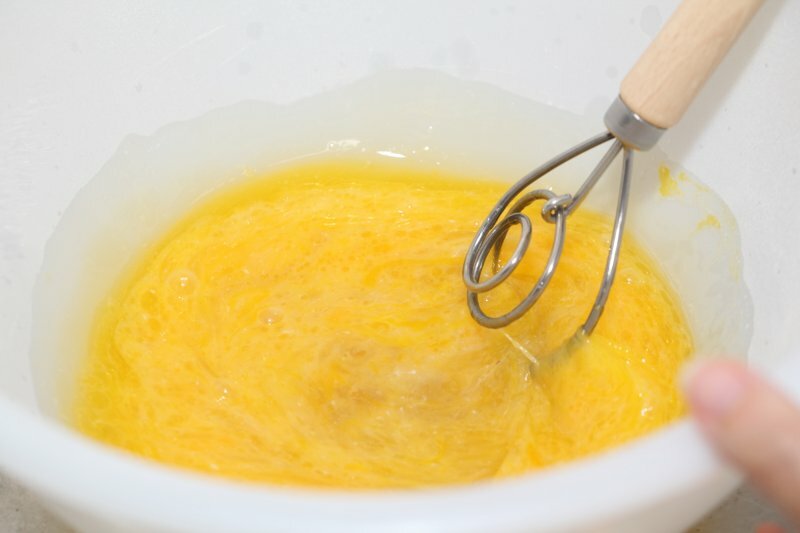 Alternatively you can brush it with some beaten egg (with a splash of water added to make it easier to brush on) just after shaping. 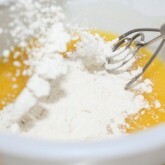 Give it a thin layer and repeat with another thin layer just before baking, same as with making croissants. Preheat your oven at 190ºC / 375ºF. 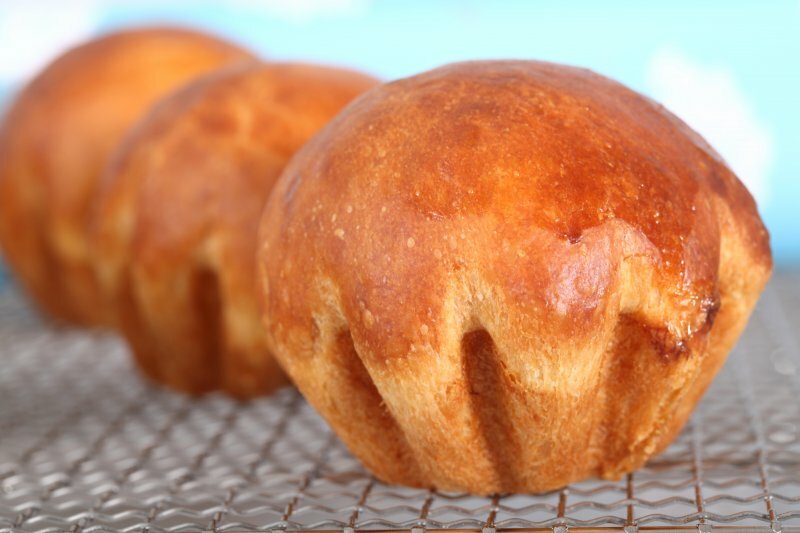 Brush the brioche with some egg wash before you put it in the oven, or brush it with some melted butter directly after baking. Bake at 190ºC / 375ºF for about 10 minutes, then turn down the thermostat to 160ºC / 320ºF and bake for another 15 minutes. If the top browns too quickly or gets too dark, cover it with some aluminum foil to protect it. After taking it out of the oven, I find it is best to leave it for a few minutes before turning it out of its tin on a cooling rack. Then leave to cool completely before slicing it. You could slice it while warm, but the crumb needs to set a little bit and slicing it too soon could press it together and make it sort of sticky. 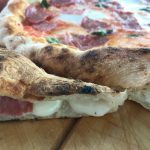 If you cannot wait please slice with a very sharp knife that easily cuts the slices without having to put too much pressure on it. 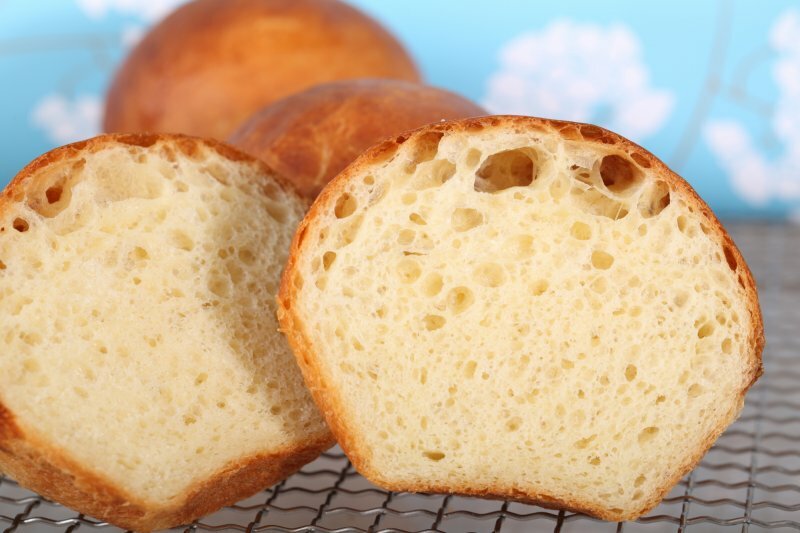 The brioche keeps very well for a few days (in container or bag) and even after that it can be given some oomph by toasting it lightly. Delicious! You can also reheat them in your oven, preheated at 170ºC / 340ºF until the outside is crisp, about 7 minutes should do the trick. 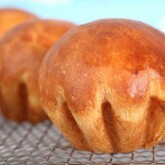 With this same recipe you can also make ‘petites brioches’. 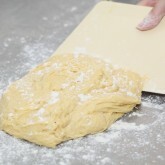 Just divide the dough in 6 equal parts, shape and leave to proof in individual, well greased tins of choice. 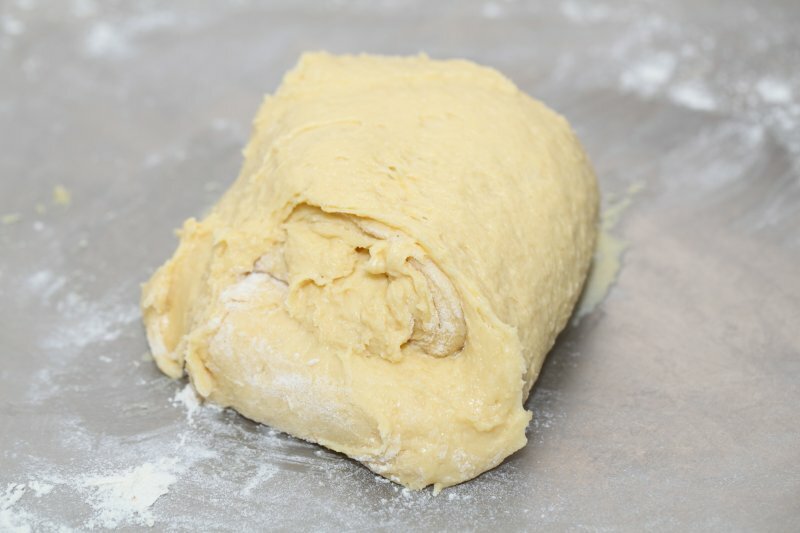 The proofing should take a little less time (something like half an hour less), depending on the temperature of the dough and surroundings of course. Because of the smaller sizes, the baking also goes quicker. Bake at 190ºC / 375ºF for about 7 minutes, then turn down the thermostat to 160ºC / 320ºF and bake for another 8 minutes. If the top browns too quickly or gets too dark, cover it with some aluminum foil to protect it. 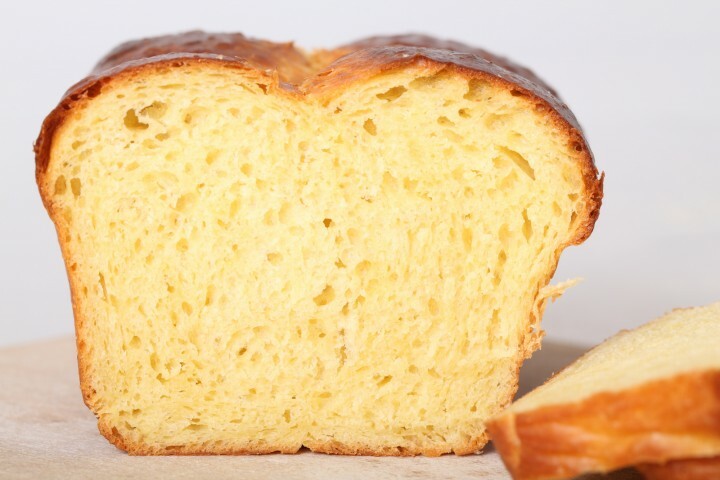 Let us know what you think of the recipe and how your (no knead) brioche turns out or how it compares to your more authentic brioche recipe. 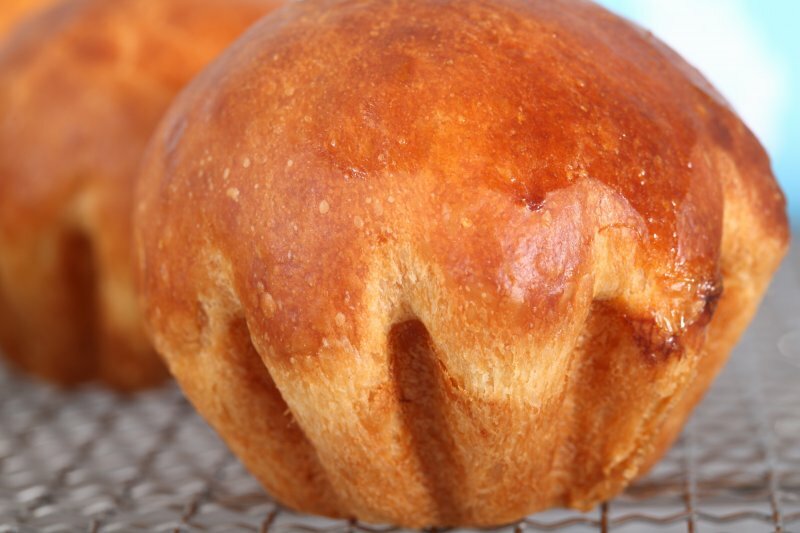 BTW The traditional brioche has a fluted bottom and a topknot and is made in a special mold. As this dough is wetter and a bit harder to shape I am just pleased to shape it quickly into balls, not fumbling with it too much. This way the shaping is done while the dough is still cold from the fridge and the warmth of your hands has not yet been given the chance to make it extra sticky. Thank you, great you liked the recipe. Yes, you can add some more sugar or substitute the honey with sugar if you like. You can make all kinds of versions with added raisins and other fruits and flavors. We think around 150 grams to 200 grams would be a good amount. 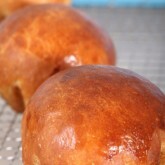 Maybe also top the brioche with pearl sugar for extra sweetness. We are sure the internet will give you lots of inspiration for different versions. Enjoy and let us know your favorite version! Excellent Recipe. 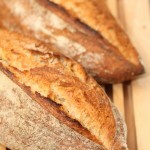 I can’t stop making this bread. It’s Soooooo good. 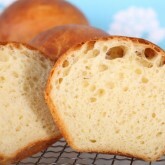 We love the process and result ourselves too and it’s also great for french toast and bread pudding with leftovers. Thank you for your great tips. Have now made it several times. Love the recipe. Great to read it’s a favorite Lydia!